Finding balance with your children when one has special needs is an ongoing effort, and a constant source of concern. I am resolute in my belief that Riley will be a better person, and we will be a closer family, for our experience with autism. And yet … the concern that we are not giving our daughter enough of our attention is never far from our thoughts. All the while, we are piling responsibilities on her more typical of the older sibling than the younger one. Just yesterday was Take Your Child To Work Day (alternate title in our house: Second Christmas). I work in hockey. 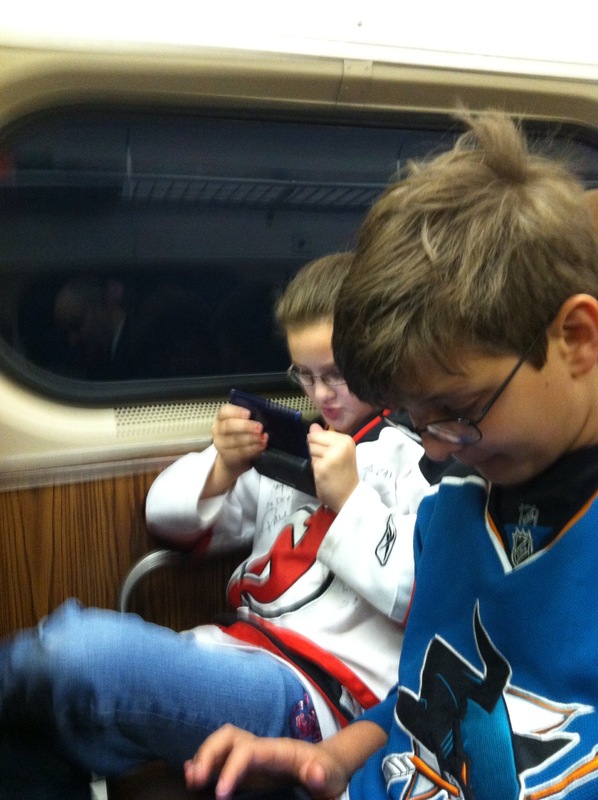 My kids get to wear jerseys, meet players, and come home with armloads of hockey swag. It is always a huge hit with both kids. But this year presented a new challenge. I had a critical meeting scheduled for the time I was supposed to have the kids with me for an extended lunch break. Others offered to help cover the gap, and I was grateful for the assistance. There was no concern about Riley, but with Ryan there’s always the fear that he’ll get agitated or need something and no one will know how to react to him the way I do. My commuting companions yesterday. Notice how engaged they are with me. Not. In preparing for this scenario the night before, I told Riley I needed to talk to her. It was not said with annoyance or regret. She was embracing the responsibility. I was so very proud of her. I calmly explained to her that though Ryan was not her responsibility, I needed her to help calm him if he got upset while I was gone. I told her she knows him better than anyone else. She nodded and promised to help if needed. The situation turned out fine, but it weighed me all day. I did not enjoy putting that weight on my daughter’s shoulders. And yet, we are a family. This is what we do to support each other. It is often spoken that the siblings of kids with special needs are forced to grow up faster, and I have no doubt that is true. So when the opportunity presents itself to put all my focus and attention and yes, my worry, on Riley instead of Ryan, it is actually a relief. Last night, hockey provided just such an opportunity. For the second time in as many nights, one of our favorite teams was playing a Game 7. For the second time, the game went to overtime. It’s been an overtime kind of week for us. We attended the Devils’ season-saving OT win Tuesday night. On Wednesday night, my Capitals eliminated the Bruins in extra time of Game 7, sending me running around the house on a very childlike victory lap. Last night, it was again the Devils’ turn, as they faced Florida in Game 7. The game was on the road, so we set up to watch on TV. With an 8:30 start, Ryan headed to bed before puck drop, still tired from his late night Tuesday. Riley’s plan was to fall asleep in front of the TV. We were given explicit instructions to wake her with 10 minutes left in the game. Just as they had Tuesday, the Devils dominated early and jumped to a 2-0 lead. But once again, they let things slip away. 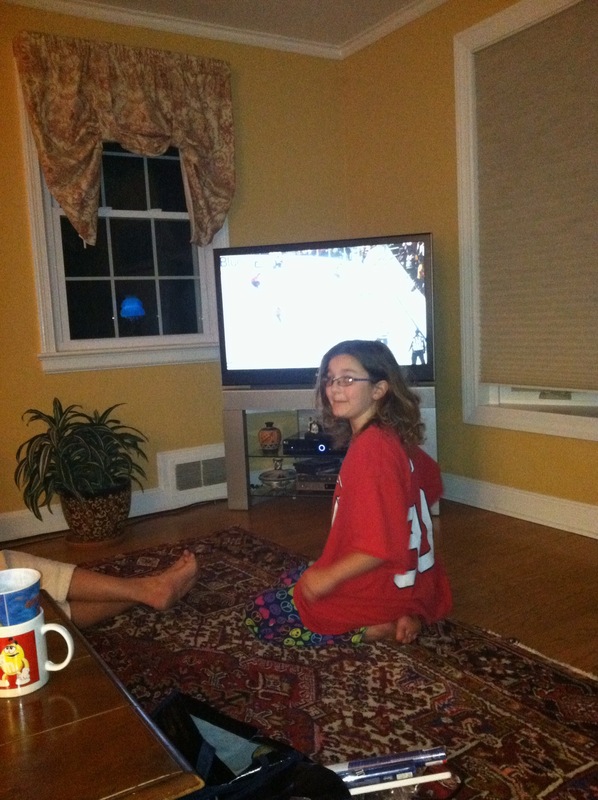 When we woke Riley, it was 2-1 and the Panthers were buzzing the New Jersey net. They scored late to tie, and New Jersey held on for dear life just to get it to OT. Riley was a mess, and there was no Jumbotron cameraman to save us this time. She alternated between sobs and lashing out at us for expressing any doubt that the Devils would win. The teams skated through a full 20-minute overtime with no score. This was torture. Every time the puck was in the Devils’ end, Riley tensed up with fear and began whimpering. My daughter tends towards the dramatic at times, but this was no act. It was nearing midnight, but there was no turning back now. We sat three abreast on the couch and held hands as the second overtime began. I wanted the Devils to score that next goal as much as I have ever wanted anything in sports. I wanted Riley to experience the same joy I had felt the night before. I wanted her to be happy. But I was so worried for her. A loss would be crushing. I remembered how much the losses hurt when I was her age, and I always felt that nobody in my family quite understood how much it meant to me when I would cry myself to sleep after yet another Capitals playoff disappointment. Even at a young age, I wondered why I cared so much, but I always came back for more the next year, because the joy of the triumphs is so worth the angst of the failures. I held her hand tight when a luck bounced loose in the Florida zone and Adam Henrique buried it for the series winner just after midnight. 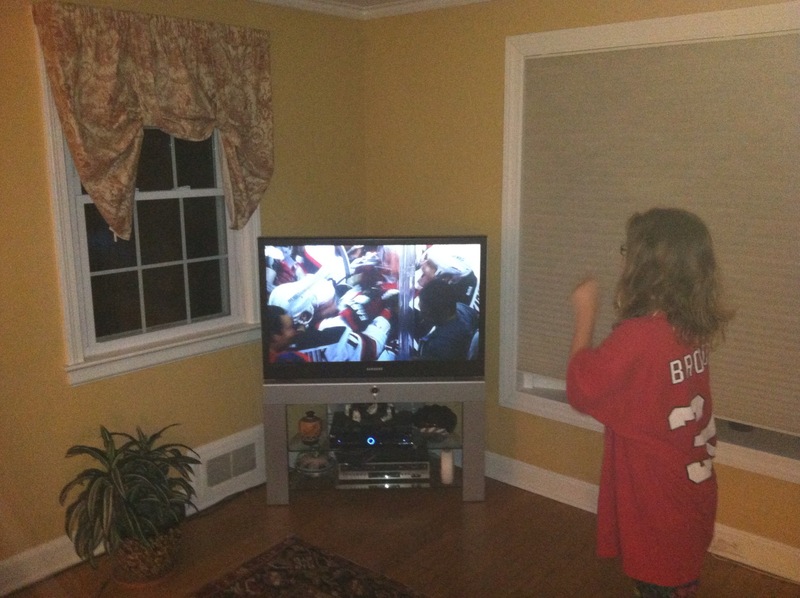 Riley celebrates the Devils' double-OT win in Game 7. Riley and Veronica burst off the couch and jumped into a long a embrace. I thought to snap a few quick pictures. If you look closely, I think you can see both joy and relief in her face. I know that’s what I felt. Relief for Riley. Joy that we have more games to attend in this magical season that none of us are ready to see end. And you know what else? It was nice to just worry about her and her alone for a few hours.